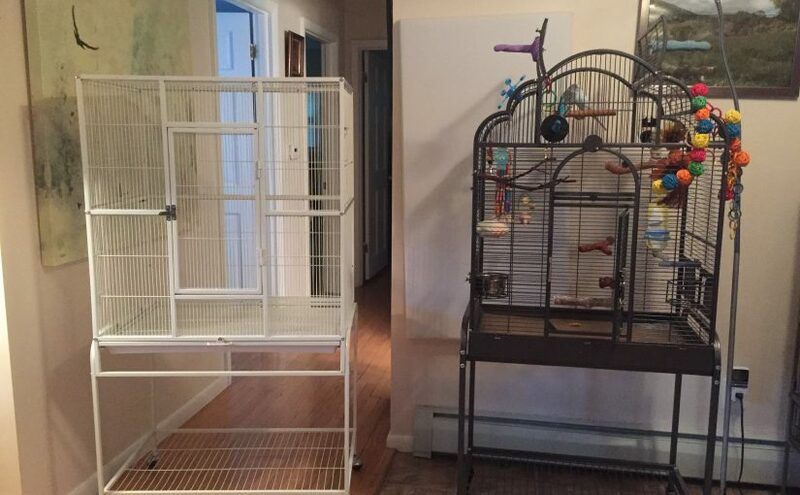 After waiting several weeks for the HQ Victorian Top cage that was solidly back-ordered, I finally canceled the order and decided to get the Prevue Pet Products Wrought Iron Flight Cage with Stand, Chalk White so that we could get Toby out of the small Prevue Park Plaza Bird Cage and alleviate some of my guilt over her situation. 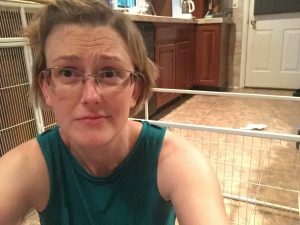 It turns out the new flight cage is even more spacious than I imagined, which may be causing Toby some anxiety, but ultimately may mean that she and Kelly could be roommates again. 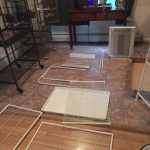 The new cage arrived just a couple of days after I ordered it, and I set to work immediately unboxing the pieces, wiping everything down and theoretically organizing it all by spreading it across the kitchen floor. Quality wise, I knew it wasn’t going to be up to the level of the HQ Victorian Top, since the price-point was about $70 less, and it definitely is lighter-weight and much less like a piece of furniture. But, it’s reasonably well constructed and extremely functional. Right out of the box I noticed a few of the bars were bent all out of shape, we were able to put it to rights, but I’m sure I could have called the manufacturer and asked for a replacement front panel. Once Patrick got out of work for the day we set to the task of assembly. Since this wasn’t our first rodeo I expected to get it put together in short order. But, one of us spent about 30 minutes looking for a tool that was totally unnecessary (not it!) and so we spent about an hour and a half total. Once together, we realized this was a much more spacious cage than the Victorian Top, having greater length and width. We didn’t have much time that evening to try and introduce the parakeets to the new cage , but they did watch us put it together with great interest. 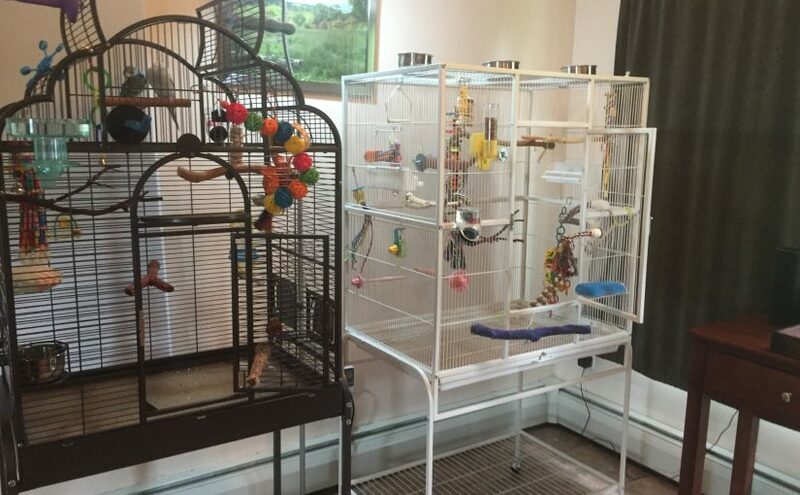 Over the next few days I started migrating toys and perches to the new cage and we tried, without putting on a lot of pressure, encouraging Toby and Kelly to explore the new cage. They are not in love with it so far, but it’s a totally different color and shape than either of the cages they are familiar with, so I can understand. The following Saturday we moved the rest of Toby’s belongings from her old cage to the new flight cage and that was that. She went in with very little protesting when it was time for bed, but spent a ton of time wandering around in the cage looking for the best place to sleep. Strangely it also disturbed Kelly who would not settle down for hours – which is very unusual for her. It’s so much room that we may try having them sleep together or even spend some days together, at present they don’t like hanging out in it even when the other cage is closed, but we’ll get them used to it at some point! I’m pleased to have Toby out of her old cage and into something where she can really flap her wings and get some exercise. Also, this leaves me an extra cage for quarantining someone new, should that occur at any time in the next few months! 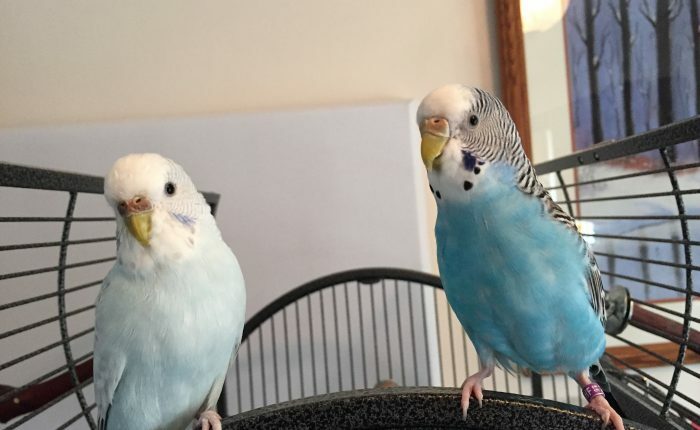 At that point (following quarantine) even if they can’t live three together we can have a single and a double and the parakeets will be able to choose the living arrangements. Toby and Kelly have been living single for several weeks now and it’s still going great. They are both getting good rest, individual attention and have enough time to play without someone else bothering or attacking them. I had ordered Toby a new cage from Doctors Foster & Smith a while ago, but it was back-ordered and the fulfillment date just kept getting pushed out further and further. So, I finally decided to cancel the order and get her a traditional flight cage. 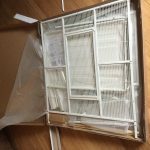 At first, we thought we would get another HQ Victorian Top Bird Cage, which has served us well for a long time. I love that it looks like a nice piece of furniture, instead of just a utilitarian bird cage. 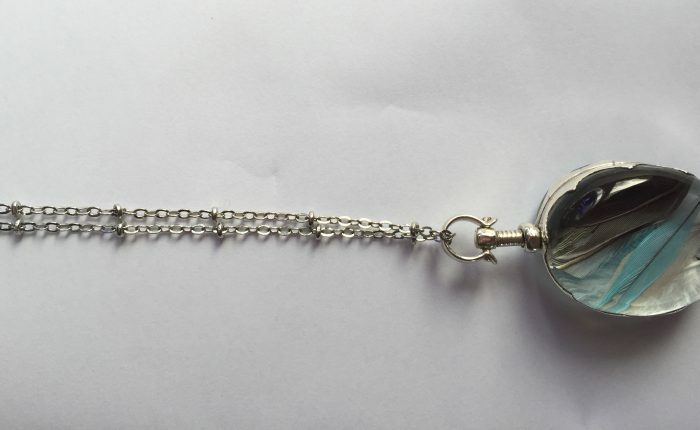 Also, it’s really solid and not at all flimsy, which is something that bothers me about the Vision Small Bird Cage that we used for a car ride. I know a lot of people love Vision cages because they contain mess and are easy to clean, but it just doesn’t feel like a permanent bird home to me. Anyway, it initially seemed like a no-brainer to just buy another HQ Victorian Top and put Toby’s new cage right next to Kelly’s existing. I ordered the cage and didn’t even notice the back-order warning when I checked out (ooops! ), so it wasn’t until 5 days later that I started wondering why it hadn’t shipped, and then realized I would still have to wait another month for delivery! I thought about canceling at that point, but Toby has been such a good sport about living in her old Prevue Park Plaza Bird Cage it’s really unbelievable. She goes right in at the end of the day and doesn’t even appear bothered that she can’t fly in her home cage. Because she’s being so chill about it I felt like we could wait the month. Fortunately she’s continued to be a solid citizen about her living arrangement, because once the month passed the fulfillment date jumped again by two weeks! I know this has nothing to do with Doctors Foster & Smith, I’m sure it’s down to manufacturing delays for the cages themselves, but it was sort of a bummer realizing that not only were we delayed again, but I really couldn’t trust the new date either. We were still pretty set on holding out for the HQ Victorian Top, but I started thinking about how much it would be a bummer to lose out on the flat top of the Prevue Park Plaza Bird Cage , which I use every day to keep food and water out when Toby and Kelly are out playing. We also put baths up there and toys for them to play with one top of the cage. The Victorian Top cage is really cool for them to hang out on, but it doesn’t have utility space the way the Prevue Park Plaza does. Since I had all the extra time waiting on the HQ Victorian it allowed me to really second guess the decision, and decide that we would all be better served by getting a good quality flight cage with a flat top. 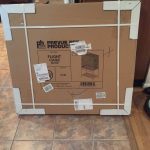 Enter the Prevue Pet Products Wrought Iron Flight Cage with Stand, Chalk White , which is made by a company I already trust, and looks like it will be a great home for Toby. The only thing I’m not thrilled with are the included plastic food and water bowls. I think that plastic bowls tend to get dirtier faster and don’t get as clean as stainless steel. I found these Stainless Steel Hanging Bowls which solve that issue. I like that they are a two part system so I can hang them wherever and just remove the bowls for filling and cleaning. Because we have Amazon Prime it should be here in just a couple of days, and I’ll be sure to report on the cage set-up and how Toby likes her new digs. Hopefully our first traditional flight cage will be a winner! When the topic of full spectrum lighting comes up it’s common to see some parakeet owners indicate they don’t need to provide a full spectrum light because their parakeets’ cage is “right near a huge window”. Unfortunately, this is not the case, windows block the essential light rays and utilizing a full spectrum light for budgies is, if not essential, a boon to their health. I think about it this way, we all know the benefits of sunshine for human beings, even though we have a risk of skin cancer, getting some rays is essential for Vitamin D production in humans and avoiding things like seasonal affective disorder. Just sitting next to a window on a sunny February day isn’t going to cut it, we must either go outside and sit in the sun or take supplements to increase our Vitamin D.
It’s very similar for parakeets and other parrots, who are even less likely than humans to go outside on a frigid February day! That’s where avian lamps and bulbs come into play. 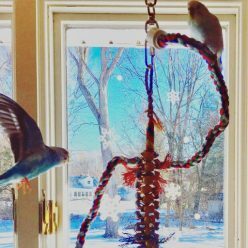 So – why is Vitamin D so important to parakeets? It aids in the absorption of nutrients, but beyond what it helps with, the deficiency of it is more alarming. Vitamin D deficiency leads to low calcium levels because the calcium couldn’t be absorbed. 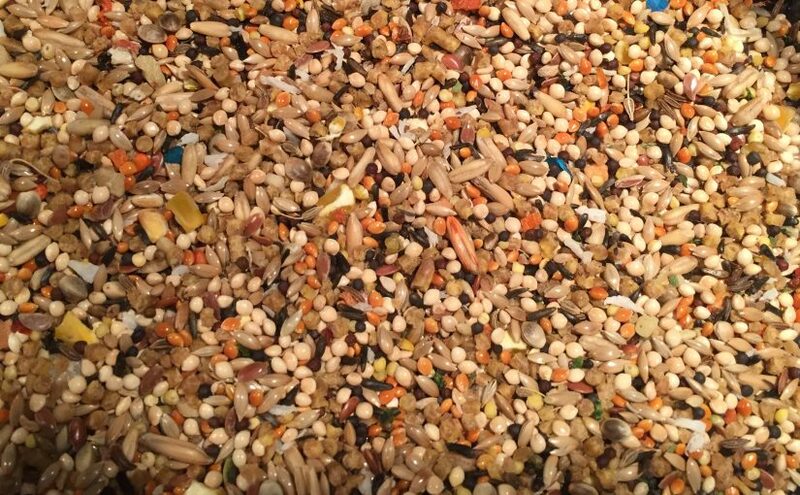 Low calcium levels can cause seizures, avian stargazing disease and cancer. These are in addition to breeding issues like soft eggs and egg-binding. On the positive site, exposure to full spectrum light has been shown to help with cranky budgies and self-harming behaviors like plucking. Budgies and other parrots get their Vitamin D in a couple of really neat ways, one is by using the oil in their “preen” glands to coat their feathers, the oil produces Vitamin D when exposed to ultraviolet rays so when the birds grooms itself again it ingests the vitamin D on its feathers. They also absorb vitamin D through their eyes, as we know, the budgies’ sense of sight is far superior to the human’s because they can see UVA and UVB rays. So, having full spectrum lighting means that you help them unlock the full potential of their eyesight, in addition to all the other benefits. To help keep our budgies healthy we have an avian lamp and Bulb , which are on for 3 hours a day on a timer. This is enough time to get them the rays they need every day. I’m hoping to get them outside for some actual sunshine this summer, but in the absence of being able to do that most days of the year it’s good to know we are providing them with some full spectrum rays 365 days a year. Now, am I going to try and say that your budgies are going to die if they don’t have full spectrum lighting? Absolutely not, I’m sure countless budgies have lived long and healthy lives in the absence of full spectrum lighting. But, if you can provide it, why not give them that extra bump of what they need to make sure they are feeling good and getting that essential vitamin D?